For your cowboy baby: His - or hers - first cowboy boots! 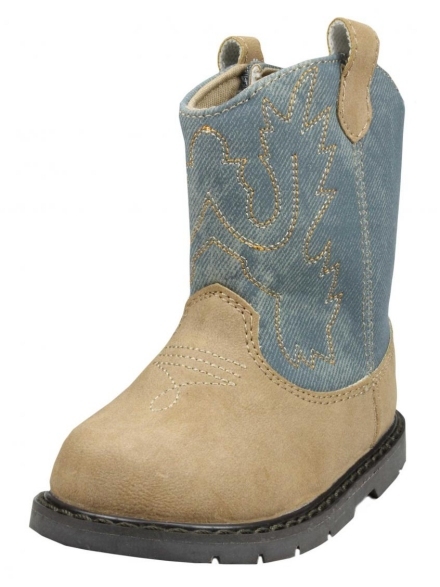 Rugged western leather-like cowboy boots in tan with a denim shaft that has embroidered accents. Durable construction and flexible support for active lil' cow pokes. Non-slip hard rubber sole on all sizes. Made with the quality Baby Deer is known for. Sizes infant 2-5 have a Velcro hook and loop side closure with a wide opening for wiggly feet. See pic below. The infant size boots have a squarish rounded toe. 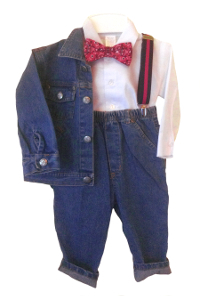 Sizes toddler 6-10 are pull-on. The walking stage has durable construction and flexible support for early walkers. Sizes 6-9 have a rounded toe and size 10 has a more pointed toe for.